The R-PLEX Human CTLA-4 Antibody Set includes a matched capture and detection antibody pair and calibrator for the quick and easy measurement of CTLA-4 in biological samples. R-PLEX products leverage MSD’s electrochemiluminescence technology for better sensitivity and a larger dynamic range than traditional ELISAs. R-PLEX matched antibody sets enable the development of singleplex and multiplex immunoassays. Individual assays may be developed using MSD avidin- or streptavidin-coated plates. Custom multiplex assays with any combination of R-PLEX analytes, as well as R-PLEX and U-PLEX analytes, can be developed on U-PLEX MULTI-SPOT plates. To learn more about the advantages of R-PLEX products click here. 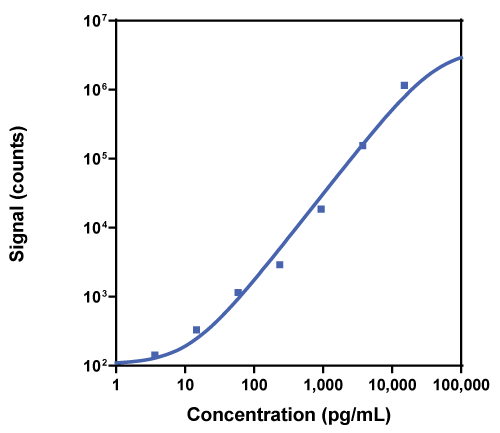 Calibration curve for the R-PLEX Human CTLA-4 Antibody Set was assessed and representative data is presented below. Description - Cytotoxic T-lymphocyte associated protein 4 (CTLA-4, ALPS5, CD152) is a protein receptor that acts as an immune checkpoint and can transmit an inhibitory signal to T cells when bound to CD80 or CD86. The membrane-bound isoform functions as a homodimer interconnected by a disulfide bond, while the soluble isoform functions as a monomer. Blocking CTLA-4 and CD80/86 interaction augments antitumor T-cell activity. Mutations in this gene have been associated with many autoimmune diseases.